The hotel offers a restaurant. Guests can unwind with a drink at one of the hotel's 2 bars/lounges. Guests can enjoy a complimentary breakfast each morning as well as a complimentary manager's reception. A computer station is located on site and wireless Internet access is complimentary. This 3.5-star property offers access to a 24-hour business center. Event facilities measuring 3498 square feet (325 square meters) include conference space. 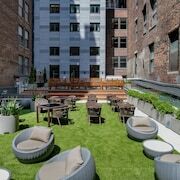 This business-friendly hotel also offers a 24-hour fitness center, a rooftop terrace, and multilingual staff. Limited onsite parking is available on a first-come, first-served basis (surcharge). A total renovation of this property was completed in 2018. 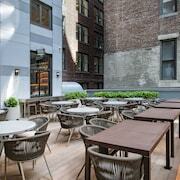 Embassy Suites by Hilton New York Midtown Manhattan is a smoke-free property. Located in Midtown, this hotel is within a 5-minute walk of Madison Square Garden, 5th Avenue, and Bryant Park. Empire State Building and New York Public Library are also within 10 minutes. 34 St. Station (Herald Square) and 42 St. - Bryant Pk. Station are within a 5-minute walk. Along with a restaurant, this smoke-free hotel has 2 bars/lounges and a 24-hour fitness center. Free cooked-to-order breakfast, free WiFi in public areas, and a free manager's reception are also provided. Other amenities include a rooftop terrace, a 24-hour business center, and self parking. All 310 rooms provide free WiFi and free wired Internet, LCD TVs with cable channels, and conveniences like sofa beds and refrigerators. Other amenities available to guests include pillowtop beds, microwaves, and room service. Embassy Suites by Hilton New York Midtown Manhattan offers 310 accommodations with laptop-compatible safes and safes. Pillowtop beds feature down comforters and premium bedding. 42-inch LCD televisions come with premium cable channels. Refrigerators, microwaves, and coffee/tea makers are provided. Bathrooms include showers, designer toiletries, complimentary toiletries, and hair dryers. Guests can surf the web using the complimentary wired and wireless Internet access. Business-friendly amenities include desks and phones; free local calls are provided (restrictions may apply). Additionally, rooms include irons/ironing boards and blackout drapes/curtains. Housekeeping is provided daily. A complimentary cooked-to-order breakfast is served on weekdays between 6:00 AM and 10:00 AM and on weekends between 6:30 AM and 10:30 AM. A complimentary manager's reception is offered each day. The Heist - This lobby lounge specializes in American cuisine and serves dinner only. Open daily. The SkyLawn - This restaurant specializes in American cuisine and serves dinner only. Guests can order drinks at the bar and enjoy alfresco dining (weather permitting). Open daily.